For the shield generator, see Castra (shield generator). 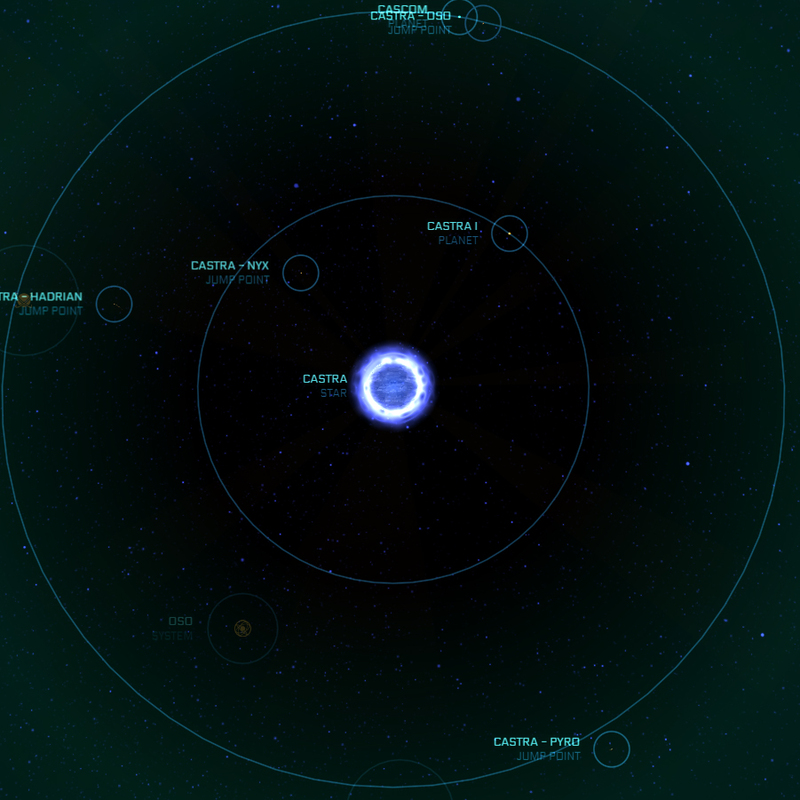 Castra is a simple system containing two planets orbiting a stunning blue-white star. "The Xi’An conflict, when it does occur — and note I say when, not if — will ultimately be determined by our strength in one system alone, Castra. I implore all of you to appropriate funds swiftly and accordingly." "The strength of the lines and the unforgiving audacity of the edifice as it pierces the firmament leaves no doubt to what the intent of the structure was, nor any room to debate that the establishment of Sherman embodied the spirit of the era as much as it helped define it." It was discovered by UPE military pathfinders probing the Perry Line for undiscovered jump points. After the initial exploration, early reports noted the system as “unremarkable” from an astronomical perspective, yet the military brass immediately grasped its strategic importance as a staging post for the brewing Xi’An conflict. The system was named Castra, after the ancient Roman term for land used by the military as a defensive position, and terraforming of its second planet began immediately. Decades later, when a jump point from Castra into Xi’An territory was discovered, the system was thrust into the front lines of the conflict. As government funding flooded the system to improve its defensive fortifications and military infrastructure, it quickly changed from a mere staging post into a focal point of the Xi’An cold war. 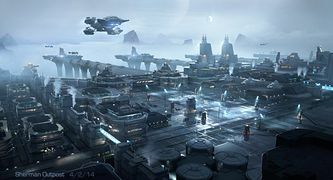 A large orbital platform was even built to support capital ships and long-range bombers, which were ever ready to attack Xi’An space should the order be given. When the Messer regime fell, the UEE tried to ease tensions with the Xi’An. 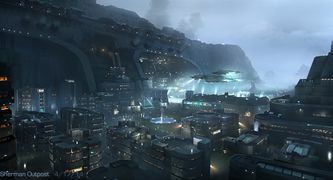 In 2789, in a show of good faith, the UEE reduced their military footprint and, for the first time after two centuries of strict control, permitted the public to move into the system. The decision was, and still is for some, a controversial one. A hawkish minority of military bureaucrats and political elites believe the system best serves the Empire as a dedicated (and solitary) military outpost. Upon Castra’s conversion, businesses arrived in droves to take advantage of the system’s exceptional infrastructure and affordable real estate. At this point, that makes Castra a prime destination for haulers looking to offload raw materials and leave with goods. Recently, Castra’s government has pushed to increase tourism to the system in an attempt to diversify their industries. The system of Castra has been vital to the UEE, but not in many of the normal ways. When UPE military pathfinders discovered the system in 2544, they found a pair of planets circling a large blue-white star. It was described as ‘unremarkable’ in its initial assessment. Regardless, the UPE began to process the second planet to act as a training facility and back-up resource cache for Hadrian system, then the point system along what would become known as the Perry Line that borders the Xi’An Empire. To mirror these military designs for the planet, the system was called Castra, using the ancient Roman name for land designated specifically for military use. Castra is a Main Sequence Dwarf-B star. Castra's first planet lacks an atmosphere or any raw materials worth mining. The UEE Navy stationed in the system used the dead world for bombing runs, earning the nickname "Bullseye".